The window shutters installed on this hallway window are representative of the exactingly high standards achieved by Shutterly Fabulous. As we continue our plantation shutters ‘full measure and installation’ service reach to other parts of the UK, we now offer no obligation consultations to residents of Didsbury in South Manchester. These hallway shutters are tier on tier. This means that they have been designed for the upper panels to open separately from the lower panels. 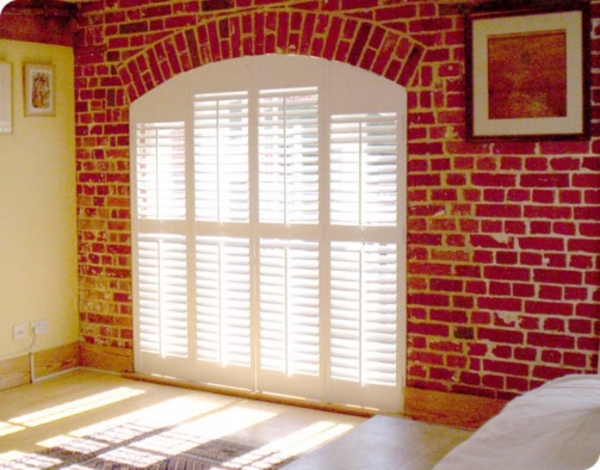 Plantation shutters that we offer are completely custom made – we don’t sell ‘off the shelf’ window shutters which are then cut down to size. When we visit your home in Didsbury or any other suburb of Manchester), we will talk you through the different design options open to you and then custom make your order to match the specification discussed. Many homes in South Manchester are built close to the road and some of those in Didsbury are no exception! The design shown is a great hallway window treatment as it allows you to swing open the upper portion of the wooden shutters, but leave the panels closed and louvers angled on the bottom. This means that if commuters are walking past your hallway window, they cannot peer in as the angled slats stop people seeing in. The hallway plantation shutters have been painted an off white colour. This is one of a number of different paint colours available to choose.